SAN FRANCISCO — In relatively simpler times, buying a car was mostly about deciding on a favorable make and model, and the affordable options to go in the vehicle. You soon may be facing another choice, having to pick between the two competing new connected car platforms, from familiar adversaries Apple and Google. At the Google I/O developer conference at the Moscone Center here, Google announced Android Auto, its in-vehicle communications, navigation and entertainment system. Google had already signaled its intentions back in January at CES, as a founding member in the Android-driven Open Automotive Alliance, now with more than 40 auto and technology partners. USA TODAY’s Ed Baig gets a first look at how Google’s new Android Auto operates. Apple rolled out its own automotive initiative called CarPlay in March. CarPlay will be included on select 2014 models starting this summer, with after-market solutions also in the works. Google expects the first cars with Android Auto to hit the road before the end of the year but hasn’t yet announced after-market options (though I would expect there to be some). Both Apple and Google have lined up lengthy lists of automaker partners, with some overlap. All things being equal, it’s a pretty safe assumption that you’ll go with Apple or Google based on whether you’re already an iPhone devotee or Android loyalist—after all the phone you connect (via USB) to the automotive console serves as the hub for the various car platforms. Having been treated to a demo of CarPlay during Apple’s own developer conference at Moscone a few weeks back, I was afforded a similar opportunity by Google at I/O. Alas neither car that I sat in for the respective demos—a gorgeous Ferrari for Apple and a beautiful red Audi A3 for Google—actually left the safe confines of the convention center where they were parked. I’m eager to get a chance to take these out on the road. One of the visible strengths of the Apple system is a familiar looking iOS-style interface. To my eye, Google’s interface was not quite as clean. But Google leverages a number of traditional strengths, notably in voice search. For example, you can ask out loud “What is the weather in Monterey?” and get an immediate answer. You can then follow up with “what are the hours of the aquarium?” and you’ll get hours for the Monterey Bay Aquarium without you having to specify which aquarium, since Monterey was the city you just asked about. Finally, you can say, “navigate there” to get turn-by-turn directions — naturally via Google Maps. You can use Android Auto to make calls, control music, send texts and run various apps. Google’s initial app roster includes MLB At Bat, iHeart Radio, Pandora and its own Google Play Music, among others. 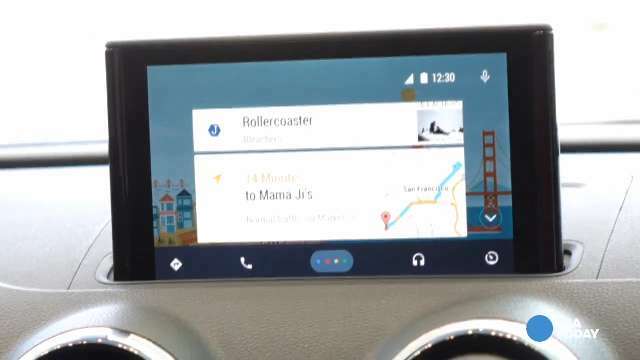 Google has released an Android Auto software kit to developers. Beyond voice, how you control the display in the car will vary by vehicle—some combination of steering wheel controls, knobs or touchscreen. The Audi did not have a touchscreen. The key to any of these systems is to avoid the kind of distractions that can result in a serious accident. Google points out that 25% of the accidents on the road occur because people are using their phones while driving.